How many of us get multiple emails every day from discount home decor sites? I don’t even know how many I get in a day but I do know that I get them from multiple sites. I also know that I love Pinterest, HGTV and all things related to making your home pretty. The sections of those sites that really appeal to me is home organization. I try to resist the urge to explore these sites because I know that I don’t really need anything for my space. Everything has its place and its function which leaves my mind feeling at peace. Even with so much effort to look away from the beautifully laid out photographs of housewares, I do give in on regular basis and browse various categories just to see what pretty things are out there. I have never purchased anything from them…. now with one exception. I first spotted this item on Joss & Main, one of my favourite sites/apps for home inspiration. They had it on sale however the cost for shipping it up here to Canada was more than the box itself. I searched for it on Wayfair, my other favourite online home site, and found it for roughly the same price. I could not bring myself to buy a box that I had no purpose for and pay a stupid amount of money for. Shortly before Christmas, I was on the hunt for my boxes of Christmas cards so that I could use them up what I had left. They were nowhere to be found! They weren’t in one of the four boxes (yup! four!) that held my stationary nor were they in my drawer of Christmas decorations and wrappings. I ended up needing to out a purchase yet another box of cards because time was of the essence. could not bring myself to pay the ridiculous price for it but wondered where else I could find the exact box but for less. I found the name of the manufacturing company and saw that Amazon was one of their retailers as well. Well! There is Amazon here in Canada! I raced as fast as my fingers could take me to Amazon (I didn’t even stop to use my Ebates account) and found the box. It was a third of thesubtotal of the other sites. There was no stopping me. I ordered that box and had it in my excited hands in just a few days. 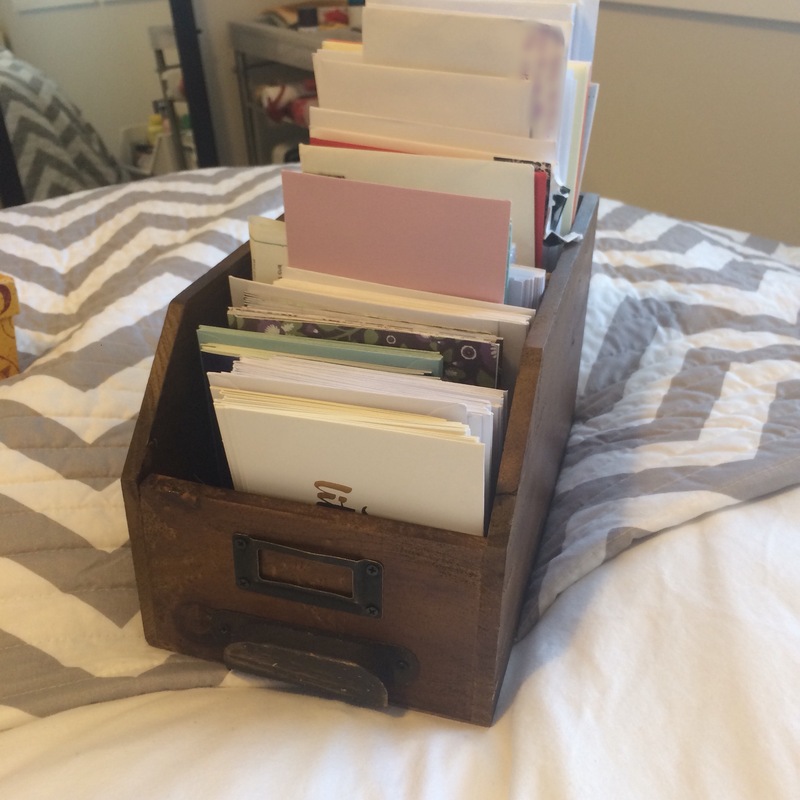 I went through my four cardboard decorative boxes and read every card, note and love letter that I had stored there. I discarded those that did not warm my heart and tucked the remaining ones into the back half of the box. In the front of the box went my collection ofblank cards, my stationary and postage. I am happy to report that everything fits now into one place, that I love the way that it is now presented, and I can get rid of those four cheap boxes. Don’t be afraid to upgrade, especially something as simple as storage of something that brings you joy. For me, I love writing and receiving letters to/from my friends, especially those who don’t live in the same city as me. There is something heartfelt about sitting down and penning your thoughts and wishes for that person that in a card or letter and sending it in the mail for them. This is just my example but it can be applied to anything that sparks happiness in you. Maybe it is your recipe cards, postcards, essential oils, or your makeup. Put them on display, let them be seen every day so that you have yet another reason to smile. It may even encourage you to use them more often and spreading that much more happiness into your day.